New clarks suede and leather sandals, 5.5 D (standard Clarks Fitting). Clarks Sandals Lilac Suede Size 5.5 . Condition is Used. Dispatched with Royal Mail 2nd Class. Clarks T-Bar Navy Suede Heeled Sandals Size 4.5. Dispatched with Royal Mail 2nd Class. Gorgeous sandals bought last year but didn’t wear them. Images are a strong representation of the sandals. Heel at the back and adjustable strap. Any questions please message me. BNWT Clarks Suede Leather Sandals UK8 Rust Orange . Dispatched with Royal Mail 2nd Class. Clarks Navy sandal, size 5. Suede leather. Condition is Used. Dispatched with eBay delivery – Shutl 2-3 days. Clarks 4.5d ladies summer sandal in a nice bright pink fuchia suede . Condition is Used. Aesthetically in excellent condition, very little visible wear but my granddaughter has been hanging them on her bike handle bars and the lining have got a little damaged, yes it's true, otherwise in great condition; it doesn't affect the overall appearance. A lovely shoe with a super designed wedge .Dispatched with Royal Mail 2nd Class. LADIES CLARKS WEDGE HEEL T-BAR SANDALS SIZE 6 FROM CLARKS HAD MINIMAL WEAR AND IN GOOD CLEAN CONDITION WITH LOTS OF WEAR LEFT. Brand new. Black suede with elasticated straps over in step. LOVELY CLARK SANDALS. 3.5" HEELS. REAL SUEDE UPPER. SMALL PLATFORM. CLARKS SANDALS SIZE 4. Condition is Used. Dispatched with Royal Mail 1st Class. Clarks collection soft cushion wide fit grey sandals. Size 4 E wide fit. Adjustable ankle strap. Clark’s softwear wedge heel sandals dark pink fuchsia suede leather 5.5. Clarks size 4. in good condition. 'TIN WHISTLE'. THE SIZE IS UK 5. THE CONDITION IS NEW NO BOX. Ladies Black Suede Wedged Sandals Size 6/39.5. In original box. Condition is Used(Good condition)Dispatched with Royal Mail 2nd Class. CLARKS chunky Black Suede Sandals- Size 7. Tried on only. Dispatched with Royal Mail 2nd Class. Clarks Sandals ‘lovely coral shade. Very lightly worn look from being in storage, however soles have absolutely no wear. Suede material with white stitching throughout. Small Wedge with plaited sole. Size 5. we do not accept returns. Condition is Used. Dispatched with Royal Mail 2nd Class. HERE ARE A PAIR OF SANDALS BY CLARKS. IDEAL SANDAL FOR NORMAL FULLER FOOT. SIZE 6 LADIES. VERY COMFORTABLE BASE/INSOLE. Very good condition . Unfortunately after giving birth, cannot wear my shoes anymore, so they are all for sale! 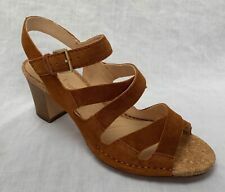 Clarks Womens Sandals Size 5 Bnwb. Condition is New with box. Bought these lovely sandals last summer they were slightly small but never round to returning them. They are as purchased with box and packaging as can be seen in photos. Any questions welcome. Clarks sandal 4 used. Good condition. Orange Suede. Sling Back. Comfortable. Clarks sandal 4 used. Good condition. Orange Suede. Sling Back. Comfortable.. Condition is New with defects. Dispatched with Royal Mail 2nd Class. LOVELY CLARK SANDALS. 3.25" DISTRESSED HEELS. REAL SUEDE UPPER. A combo of black, tan and snakeskin. In super condition, lots of wear left on the heels. Can be dressed up/down for whatever occasion. I have used the Clarks Size Chart. UK 4 D Regular Fit. Clarks Women’s Suede Sandals 8. Brand New.